I feel so far away from the border. So unable to help. But these atrocities have really shaken me. I can’t stop thinking how the separated families at the border must feel. And not only that they are separated, but then the continuing trauma they are subjected to. If you aren’t fully educated on the subject, I’d recommend reading this explainer by Vox. And, this post by Elizabeth Warren, detailing her visit to detention centers at the border, is a must read. It was posted to Facebook, but she is also submitting it as a letter to the Department of Homeland Security and the Department of Health and Human Services. All of this can make one feel helpless. But there are ways to help from afar. Of course donating. And this post from Together Rising details volunteer opportunities. But also the crisis isn’t as far away as the border. The children have been transferred to detention centers all over the country. Pro Publica has created a map and is asking for help gathering details. And remember that there are ways to help in your own community, even if it isn’t directly for these families. Find your local refugee resettlement group and volunteer. Seek out a foster care organization and see what support you can give local children. The more details come to surface about these atrocities, the more horrendous and horrifying it is. But there are small intersections and acts of resistance one can take. And keep talking about it. Keep being horrified. Don’t let this become common place or hidden in the news cycle. Keep being a human feeling for other humans. Harriett Beecher Stowe was likely talking about abolition or women's rights when she wrote this, but it feels prescient to any task requiring effort. I stumbled across Darling magazine a few years ago. Looking for a more "grown up" or nuanced woman-centric magazine with a feminist lens, I subscribed. Though somewhat of a luxury, due to the expense, this quarterly is worth it's very hefty weight. One of the tenants is that no woman you see on its pages, in original content or advertising, is retouched. 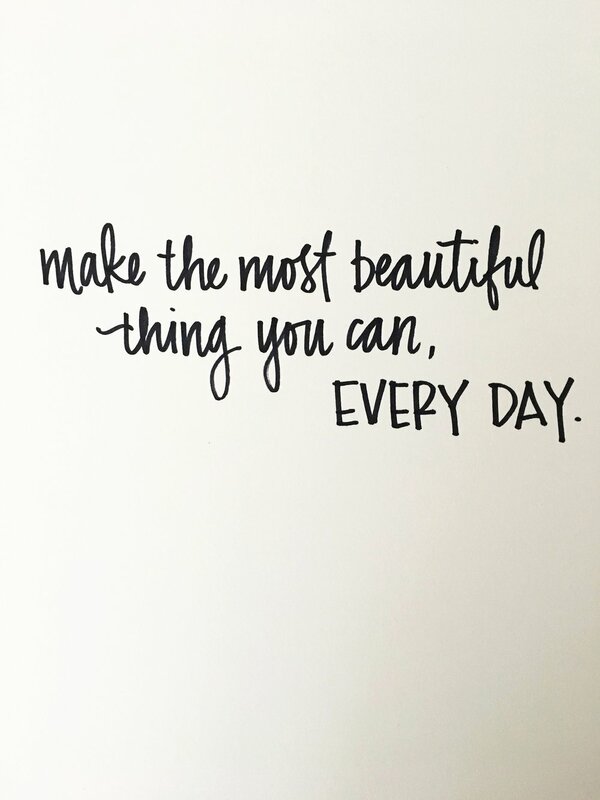 It seems so simple and yet it is so bold. Recently the magazine founders launched an entire media company with the same ideals, to spread their messages beyond print. I'm excited to be a founding investor in Darling Media. And the below is part of their mission statement. Diversity of features, models, and content are part of the overall empowerment message of the magazine. The mission statement appears on the back of every issue, instead of advertising. One of my favorite months! The #write_on challenge has begun for April. I love that this month ramps up my handwritten correspondence. I love assembling the supplies almost as much as dropping a thick stack of envelopes in the box. See some previous years work here and here. And stay tuned for outgoing mail! I’m not sure if this counts as #mondaymotivation but I ran across this quote by Atticus and just had to write it. An aspiration for us all, perhaps. On this International Womens Day, we must remember those of us with the harder fight. Those who so often are our voice of reason. Remember to stand up for black women's voices; let those voices lead us. We are all sisters, and there is much we can do to hold each other up. Valentine's Day is the same week as my partner's birthday, so there is usually much fanfare. This year, however, life got in the way of much celebrating. So we are just trying to enjoy the time together. Last fall I was approached by a designer to help detail a furniture showroom for Haworth. They were looking for handlettered inspirational signs to pair with Patricia Urquiola's "Openest" line at the launch in the DC showroom. The furniture line is designed to invite people to gather, share ideas and focus on a task (even if that task is occasionally relaxing). The signs were in multiple languages and multiple sizes. It's my highest profile and largest commission to date, even though my work was anonymous! Lots of mapping out which phrase looks / feels best on which size paper. And then lots of paper cutting. Zora Neale Hurston is infinitely quotable, but on this MLK, Jr Day it is important to remember her contributions to documenting her rich racial heritage. An influencer of many authors and poets from the Harlem’s Renaissance, Zora is the OG #blackgirlmagic. And while there is chasm between her life and mine, I’m so inspired by her words and texts. This new year, this quote particularly resonates with me. Bring it on, world. 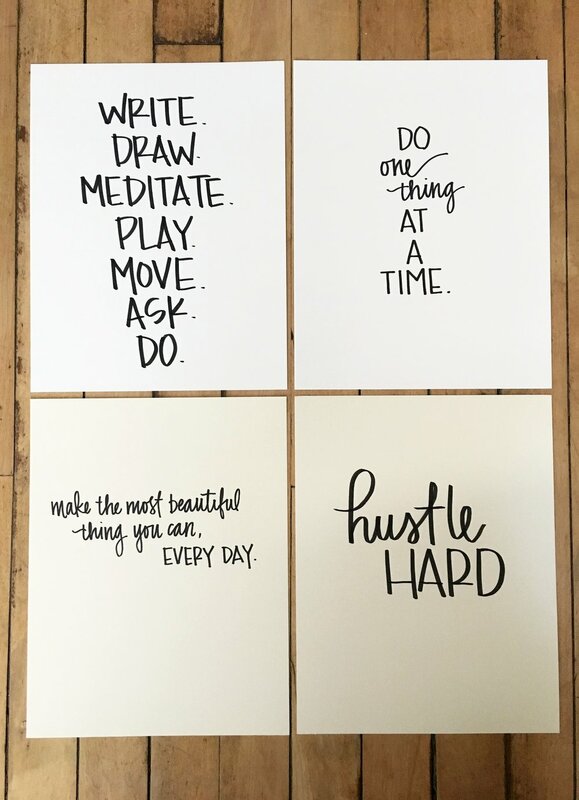 The past couple years I've chosen a focus word instead of setting resolutions. (2016: Quality, 2017: Resistance) This year, I'm opting to do the same, to help structure my next 12 months and remind me of my priorities. 2018 will be Patience. I am not the most patient person by default. So this year will be about taking a pause when before I wouldn't have, giving the benefit of the doubt, keeping quieter, and allowing myself to take the time. In our current times, as citizens of society, we could all do with a bit more patience for each other. Listening and having a bit more restraint before we jump to conclusions or assumptions. Taking the time to appreciate the nuances and layers of those around us, and remembering that we never know a person's full story. (Recently a co-worker's husband passed away, which came as a surprise to those of us at work. But he'd been living with cancer for some time, and she kept it a secret for her own personal reasons. Not that I was ever unkind to her, but could I have been kinder had I known?) Be kind, be patient with everyone we meet. As a parent, my patience is continually tested. I hope to be a better example to my kiddos, and cultivate their ability to be patient as well. They deserve that. And I hope to be more patient with myself, to give myself grace, and in moments of anger or annoyance try to identify what I'm really feeling. Ursula K Le Guin wrote it beautifully when she said, "If I'm in an angry mood and aware of it, I can ask myself, So what is it you're afraid of? That gives me a place to look at my anger from. Sometimes it helps me get to clearer air." Ideally I can get myself into some clearer air this year. I am sure 2018 will continue to test us all as a society, and certainly myself as a parent, and an individual. Hopefully I can meet the challenges with grace and patience. It's that time of year. Holiday greetings have been spread far and wide, for us this year in both analog and digital format. My love of mailed correspondence and hand lettering really culminate this season. Not to mention that the reason I started this site was based on encouragement after sending out my annual holiday greetings in 2013. But I also just have a fondness for the intimacy of a "Christmas letter". I was happy to see this article in Darling about the author's "unapologetic love for the Christmas letter". Certainly a pristine family photo has become en vogue with so many web services printing it with a well-designed border on beautiful card stock. But I love hearing a family's perspective on their year. Certainly it allows my partner and I to reflect on our accomplishments and our adventures, and think about how we've grown and changed in the course of the year. 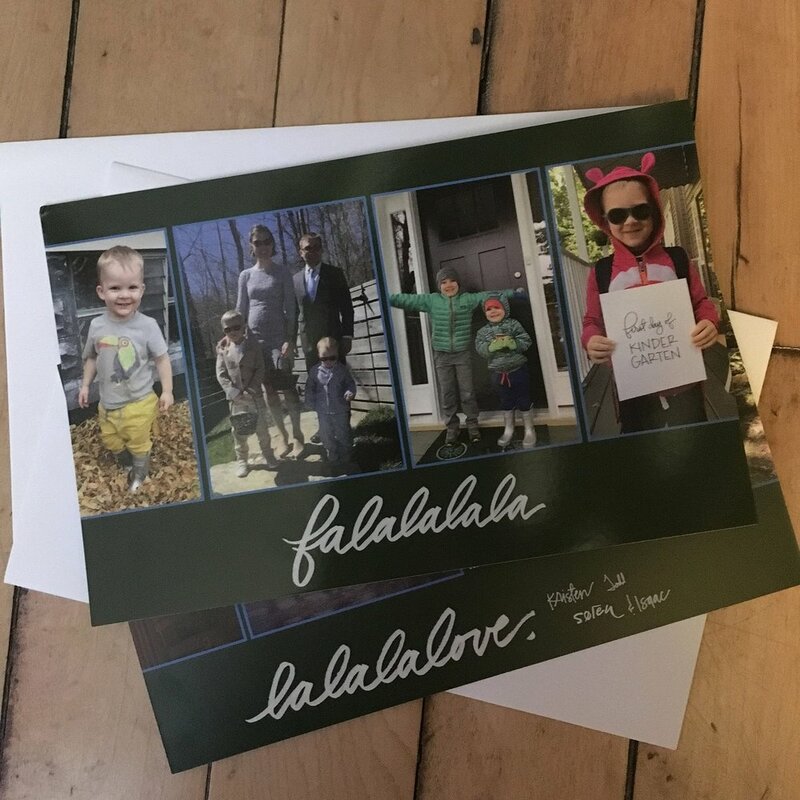 Due to time restrictions with a young family, most of my cards could not include handwritten greetings in addition to the printed message this year. But all of my envelopes were lovingly hand-addressed. I love picking out stamps for each recipient. It's like a little scavenger hunt through my collection. I love the part where you put a thick stack in an 1950's mail slot at the post office, and hear the "thunk" of it landing on the other side. While my young children don't yet appreciate a nicely wrapped present, for ones I send out, I like to take some care to wrap them neatly. This year the wrapping paper was store bought (I'm actually not sure how we acquired it), but I do like attempting reuse where possible. And I have a staunch no-bows rule. Not only do they offend my design sensibilities, but they are immediately trashed. Washi tape and baker's twine certainly suffice. Packages all ready to go. Hope the recipients enjoy opening as much as I enjoy sending! There really is little better than getting something fun and lovingly designed in the mail. Last year, during National Letter Writing Month, I ran across More Love Letters, whose mission is to spread love to those who need it. 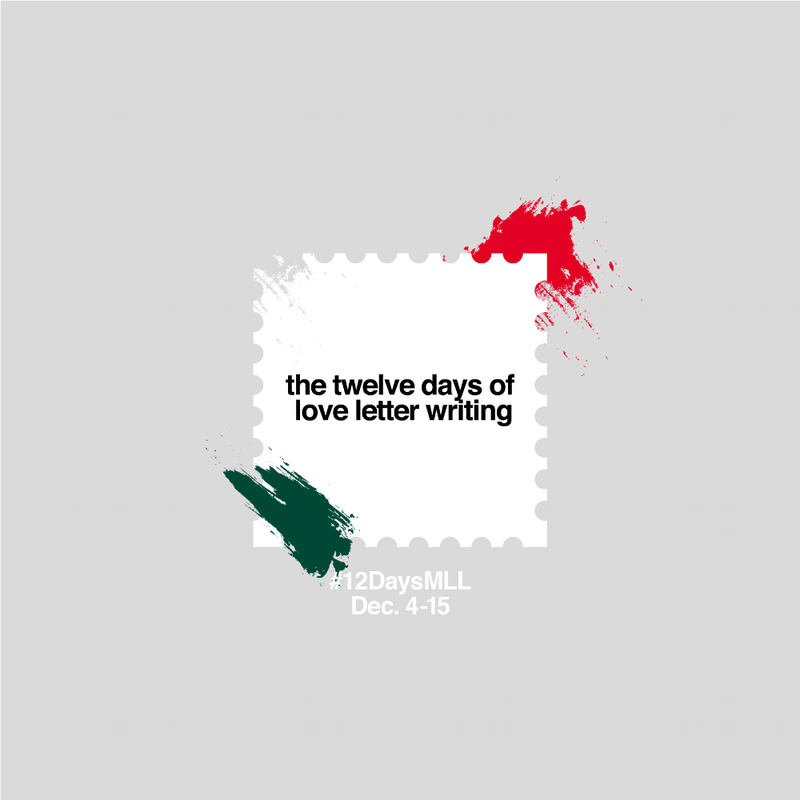 I'm excited to be participating in their 12 Days of Love Letters this holiday season. Each day for 12 days, they will reveal a new request for letters, so you can send some handwritten love during a season when many people need it. It began on December 4, but I'm especially drawn to today's recipients. Found some cheery cards in my stash. “REAL school serves middle school students who require structured therapeutic school-based supports and are at-risk in the areas of academic achievement as well as emotional and behavioral development. Most are dealing with challenges at home and in the community–trauma, abuse, violence–as well as mental health disorders. They and their families oftentimes lack access to effective resources and lack exposure to people outside of their communities, city, and the world around them. Research shows that these types of disconnections lead to ongoing struggles: incarceration, homelessness, a lower lifetime earning potential, chronic difficulty getting and keeping a job, living in extreme poverty, lack of health insurance, substance abuse, and chronic depression. Our students (we currently have six boys in the program, ages 12-14) are resilient, vibrant, creative, outspoken, musical, funny, caring, curious, resourceful, athletic, and often, overlooked. They love to rap, dance, play sports, do arts and crafts, and learn about others. They deserve to feel appreciated and supported. They deserve unconditional positive regard. And, most of all, they deserve to feel connected with others. If you have questions about the process, visit the More Love Letter FAQ.